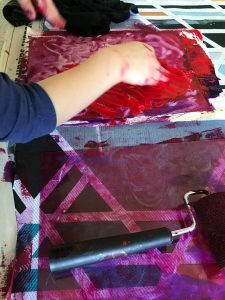 For very young children, printmaking is a source of fascination and challenge. 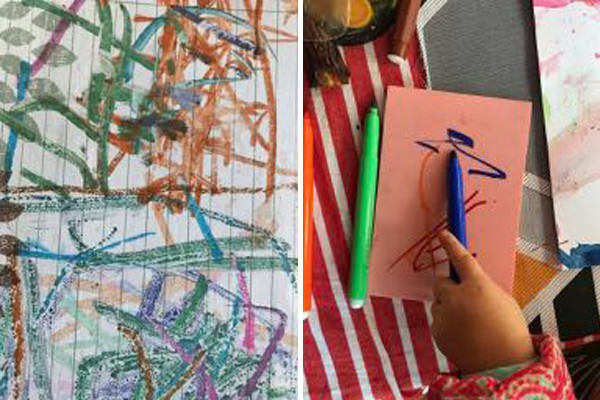 Children love the idea of multiples, making not only one image but several.The first prints children make are normally hand prints. As they learn to cut paper they will be able to prepare a printing block/collage and they will be interested in telling stories with shapes. 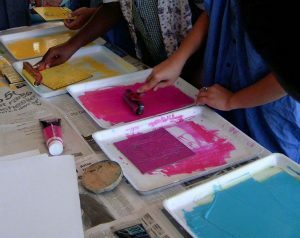 Printing block preparation: Children will have a small piece of 1mm thick base onto which shapes will be glued. They will cut or tear different shapes of their choice. The base for the printing block should be a bit heavier than the card for the shapes. Manilla card is ideal to cut shapes from. Each student should have at least 2 or 3 shapes. After the collage/printing blocks are finished, they should be left to dry overnight. 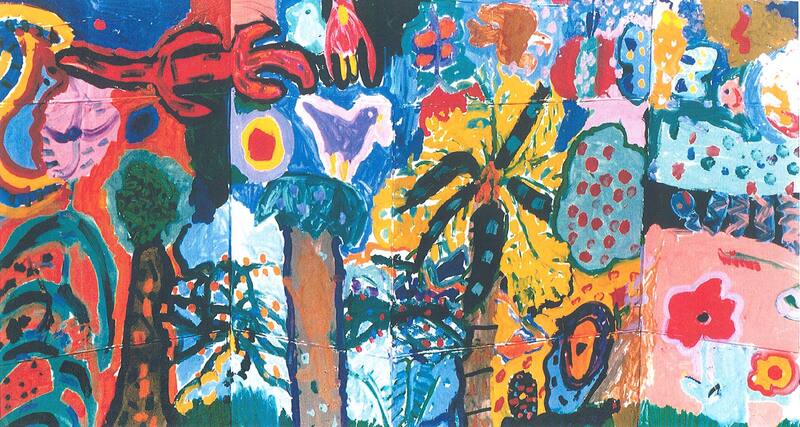 Older children who have collage experience will cut more shapes to add a narrative to their prints. Cover the table with sheets of newspaper for easy cleaning. Provide small containers with wet rags to clean hands and messy equipment. Set up 2 or three pairs of foam trays, fish and chips kind of trays, one to roll out the paint and the other to apply paint on the collage/block. 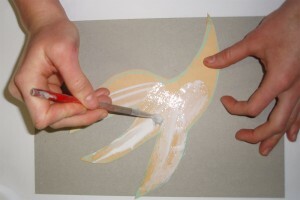 Using a foam roller roll out the paint before applying on the collage, see picture. Place the inked collage/block facing up and then place the paper on top. Rub gently with flat hands, pull the print. 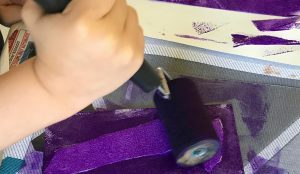 Felt Pen printing: Instead of using paint children will use water soluble felt pens/markers.Use felt pens to draw on a piece of rubbery material or a Gelli Pad*. 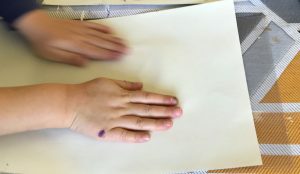 Wet the paper with a damp clean sponge before printing, place the paper on top of the drawing and rub gently to print. 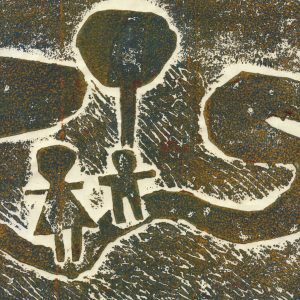 Monoprinting: is one the first printing experiences for children. It can be done in a very simple way. 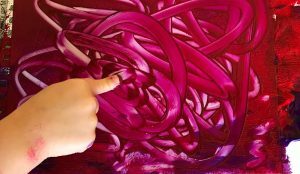 Roll out paint on a plastic sheet/tray and ask children to use their fingers to create patterns and textures. When the patterns are ready place the paper on top and gently rub it. Leaf Printing: Find nice big flat leaves in the garden. Place leaf on tray and roll paint on it. Carefully pick up the painted leaf and place it on the table or a clean tray. Place paper facing down and rub gently. 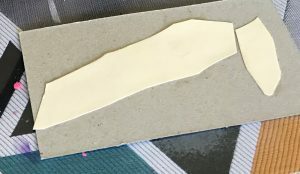 1 piece of A4 size Manilla card, from old Manilla folders to cut the shapes from. 4 pieces of paper to print on per student. Paper can be cartridge paper, copy paper, brown paper, coloured paper or pages of old books or magazines. One clothes drying rack with pegs to hang up the prints to dry. Note: * Gelli Pads are commercially available from school art materials suppliers. 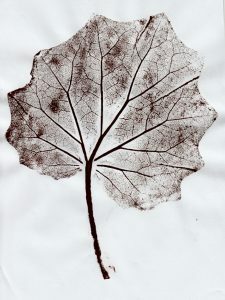 A simple Printmaking Project to do at home or in the classroom, using leaves to create prints, repetition prints and greeting cards using basic equipment. 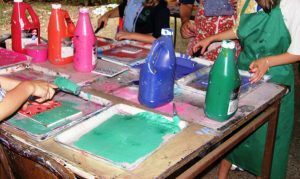 Printing on cards is a very creative way to have fun and let children create some really fun projects.